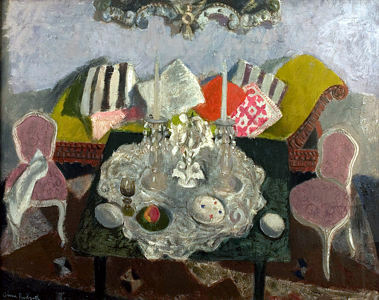 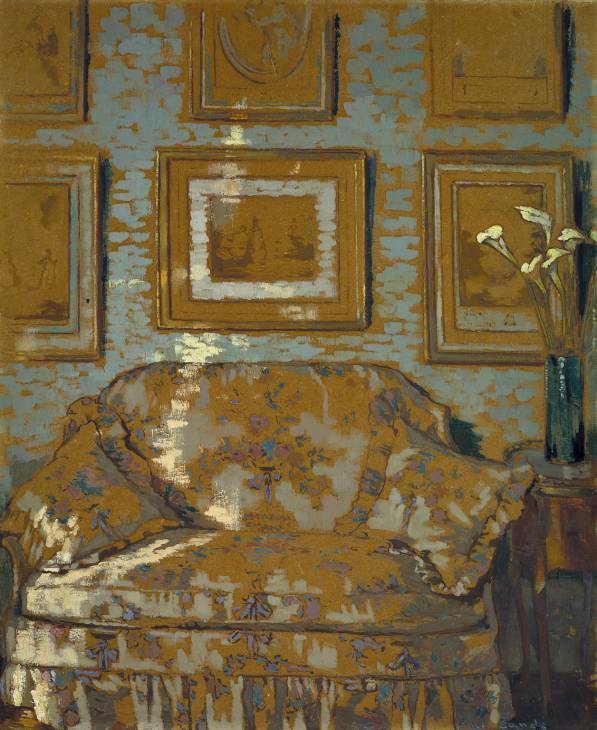 Above: Ethel Sands (1873-1962), "The Chintz Couch", 1910-11, Tate Collection. I'd never heard of Ethel Sands till I came across this painting. I was really taken with it... the way the light shimmers and the texture of the wall is so compelling. 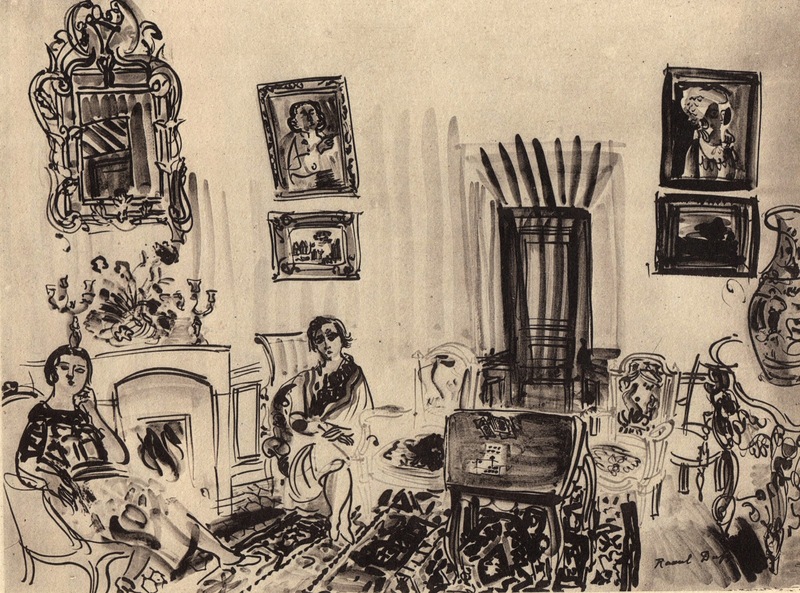 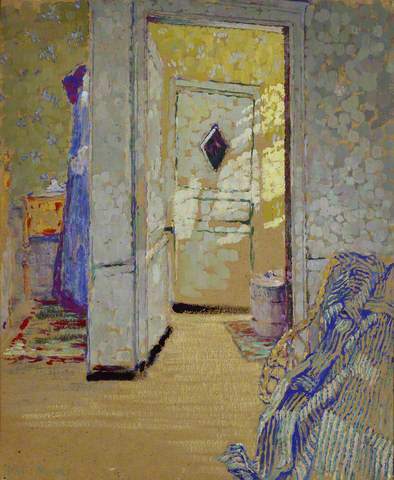 Above: Ethel Sands "The Dressing Room". 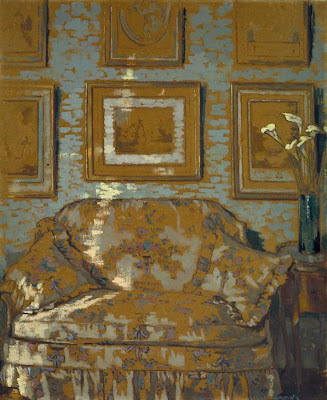 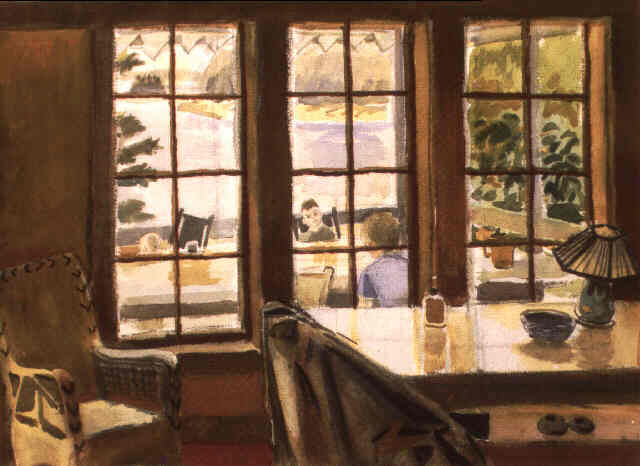 Sands is clearly influenced by Vuillard. 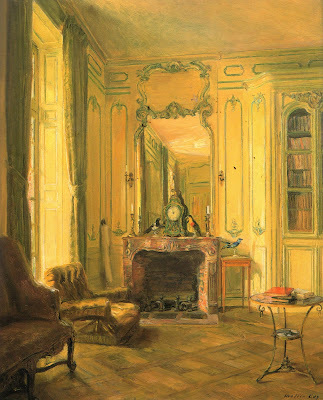 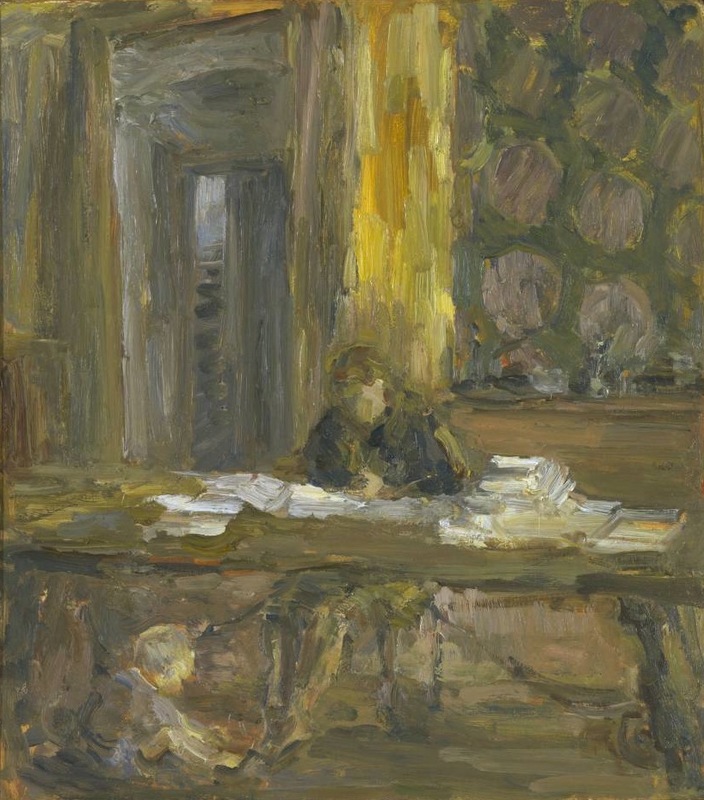 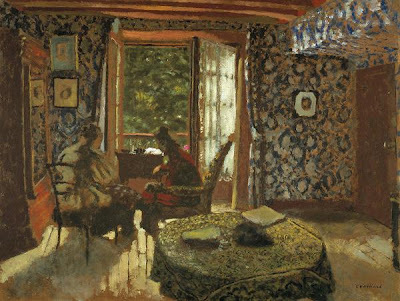 Above: Edouard Vuillard (1868-1940), Interior, 1902. What I love about this painting are the thick white lines of paint on the floor and French doors. 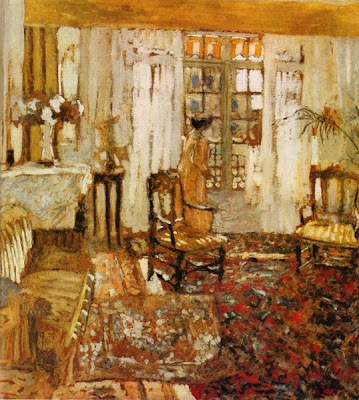 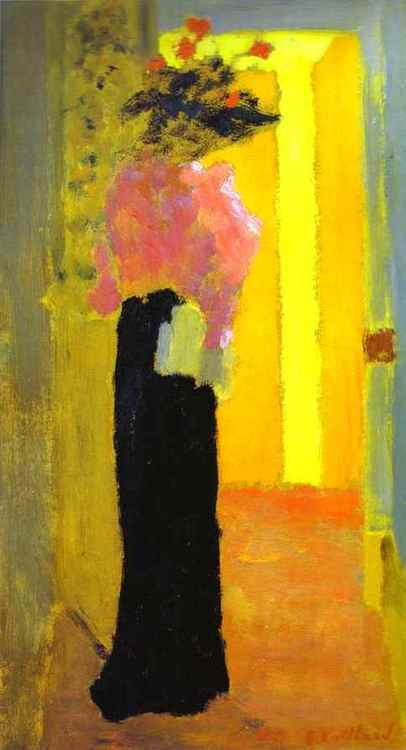 Above: Edouard Vuillard "Woman Before a Window". You see the same thick white stripes of paint here, and the stripes also repeated in the awning, on the sofa back, wall covering, and chair seats. 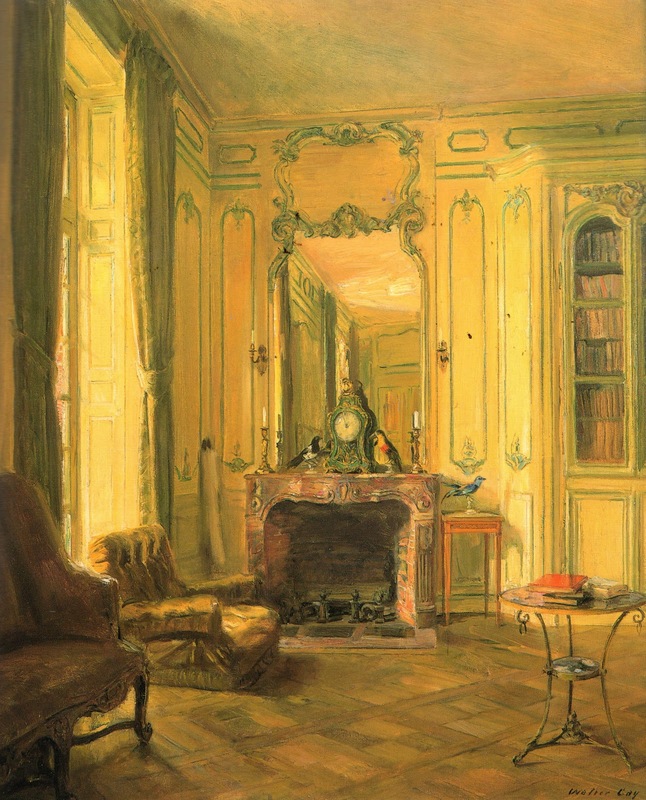 Above: Walter Gay (1856-1937) "The Library, Bréau". 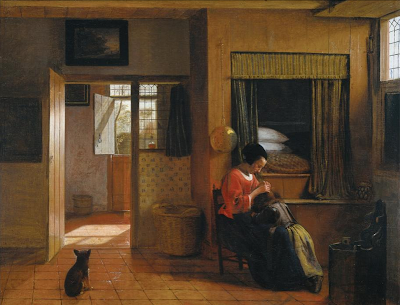 One of the reasons I like this is the way the room is suffused with sunlight. Above and Below (detail): Dawn Clements "Mrs. Jessica Drummond's", 2010. This was drawn from scenes in the film "My Reputation, 1946", and was included in the Whitney Museum 's 2010 Biennial. 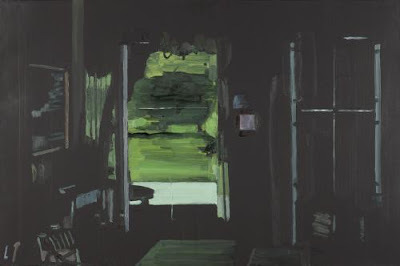 Above: Richard Walker "Curtain I" 2011. 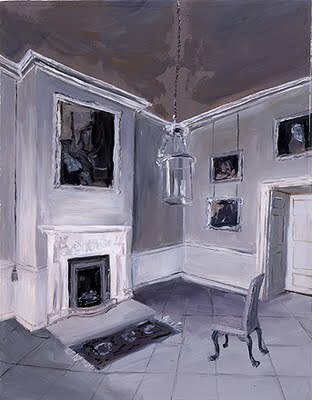 Walker's oil on panel paintings show rooms in a grand manor house, "The Haining", in southern Scotland which offer's artists' residencies. 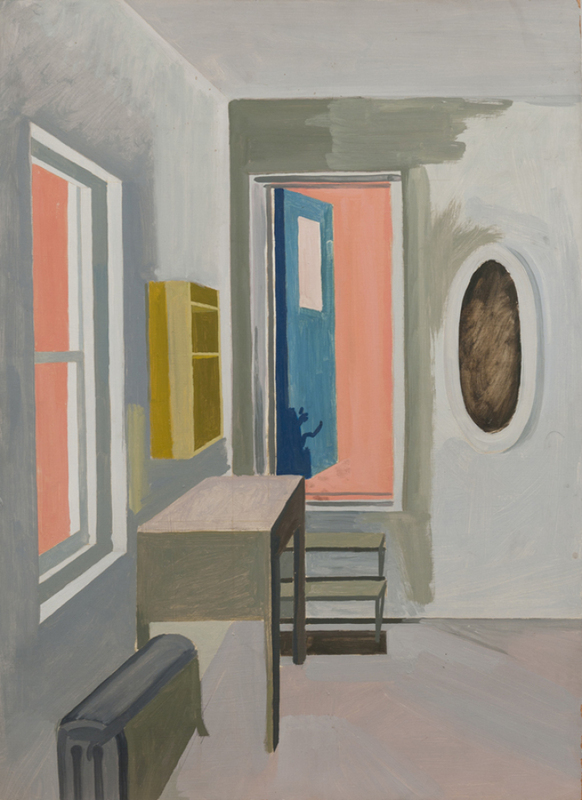 He painted from life rooms that were cluttered with stored furniture and memorabilia, using projections on the walls that create a mysterious sense of space. Roberta Smith describes the work beautifully in her NY Times review. You can see the whole show here. 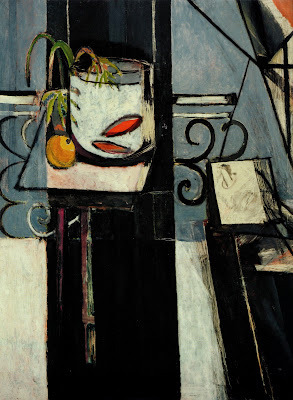 Above: Henri Matisse "Goldfish and Palette" 1914. 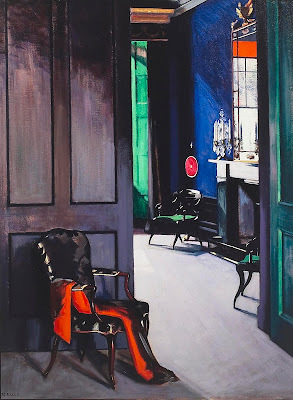 Above: Francis Campbell Boileau Cadell (1883-1937) "Interior with Opera Cloak". Above: Karen Kilimnik "The Head Witch's House, Reception Room", 2005. 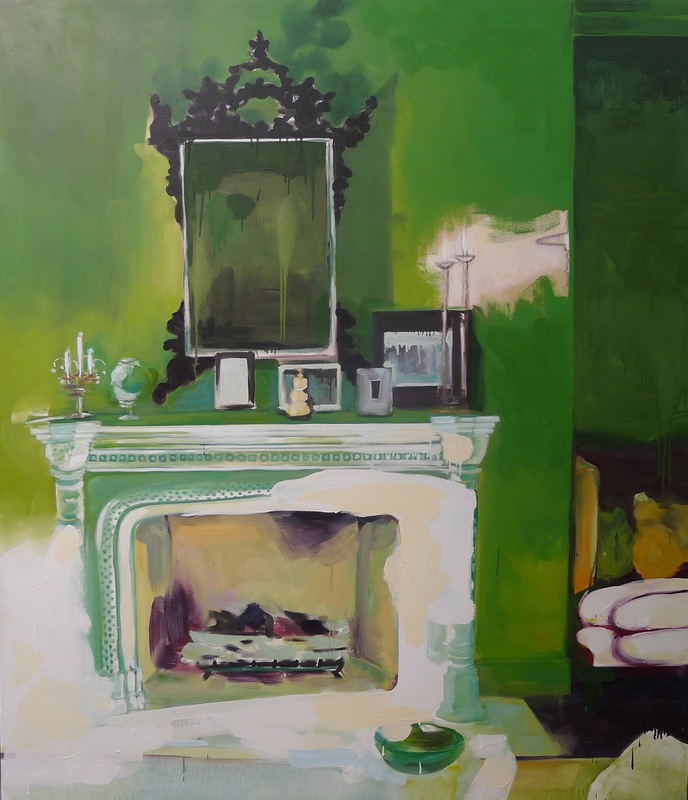 Above: Kathleen Melian, "Remains of Desire" 2012. 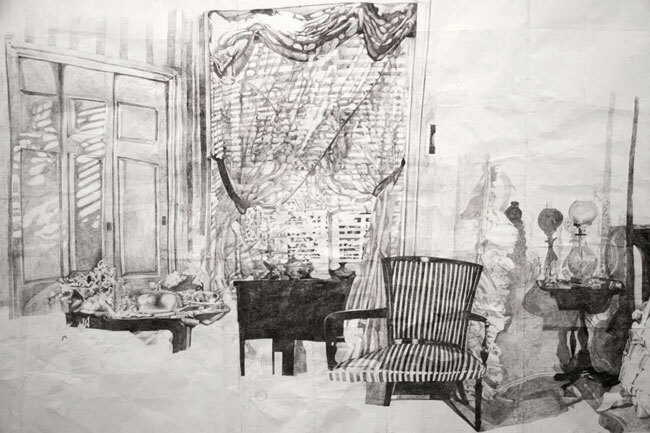 From an MFA Thesis show last spring at Claremont Graduate University. 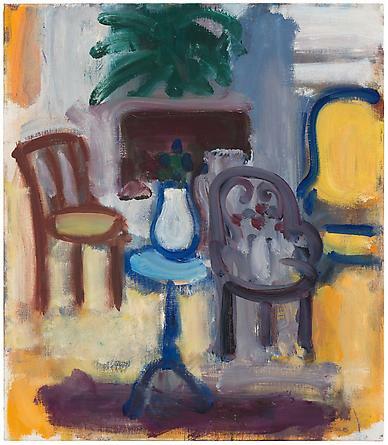 Above: Robert De Niro Sr. "Still Life and Three Chairs", 1983. From a show at the DC Moore Gallery April 2012. 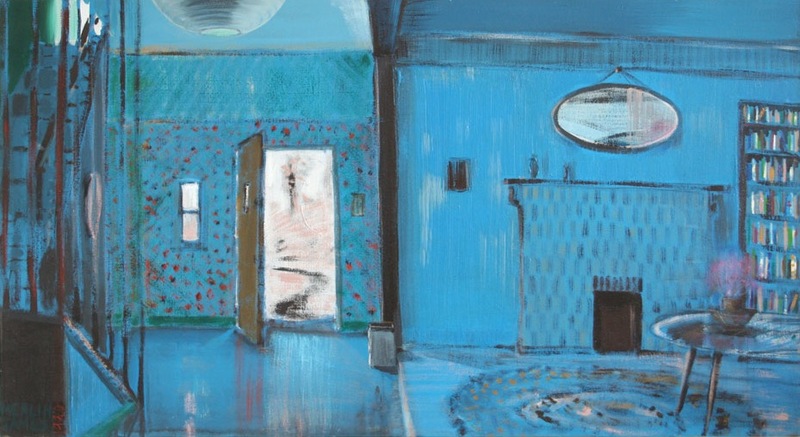 Above: Merlin James "Blue Room" 1990. 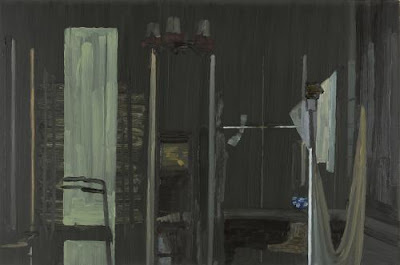 Above: Lois Dodd "Loft Interior" 1968. 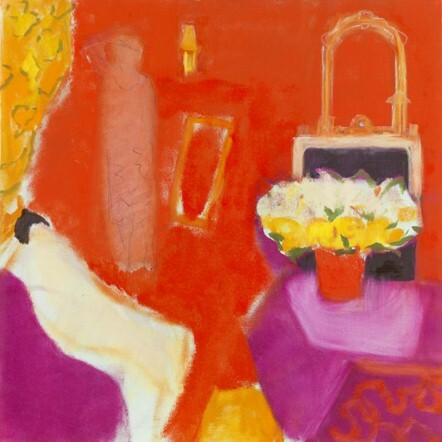 Dodd currently has a wonderful show at the Alexandre Gallery on 57th St in NY. Above: Edouard Vuillard "L'Elegante" 1891-2. 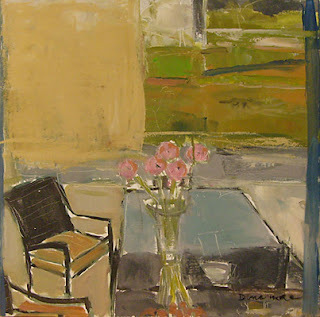 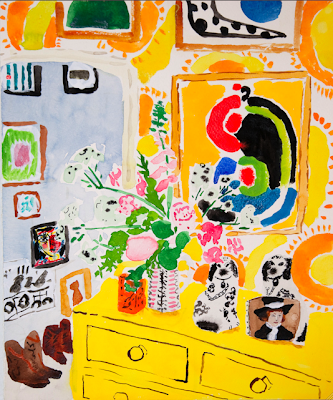 Above: Anne Redpath "The Yellow Sofa". 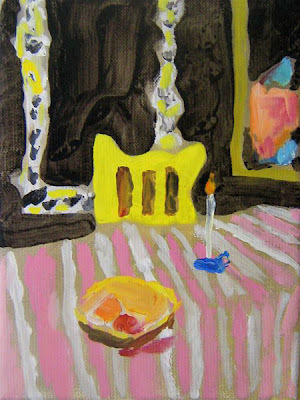 Above: Bella Foster "Birthday Candle". 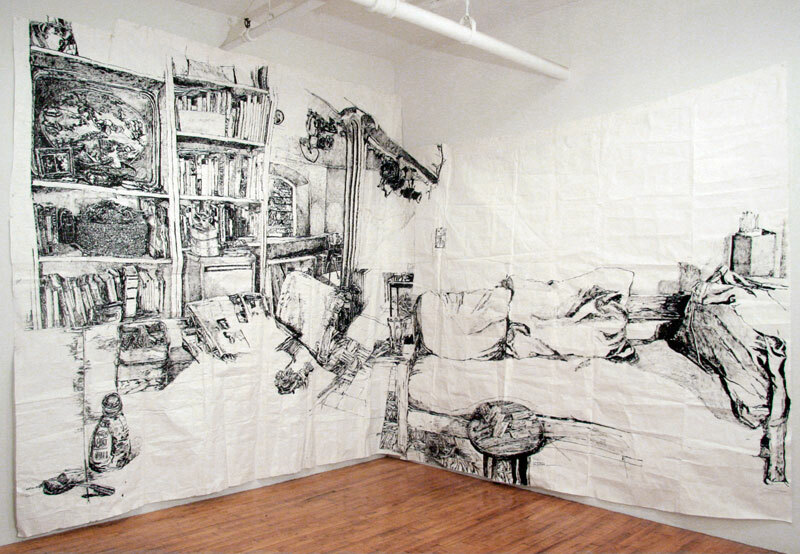 Bella Foster is a contemporary artist, living and working in Los Angeles. 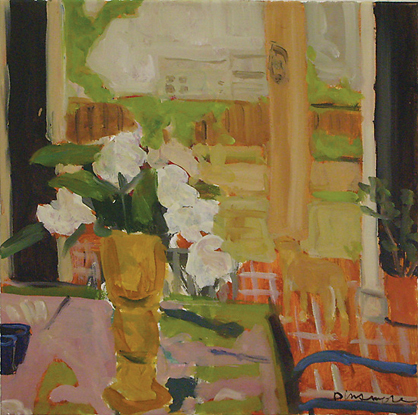 You can see more of her work here and here. She's chosen a very similar palette to the Redpath above. Above: Maira Kalman "The Glass House" 2005, from the reissued "Elements of Style" illustrated by Kalman. 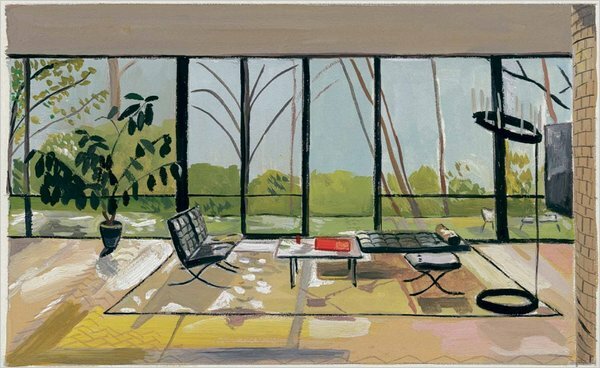 This is a depiction of Phillip Johnson's glass house. 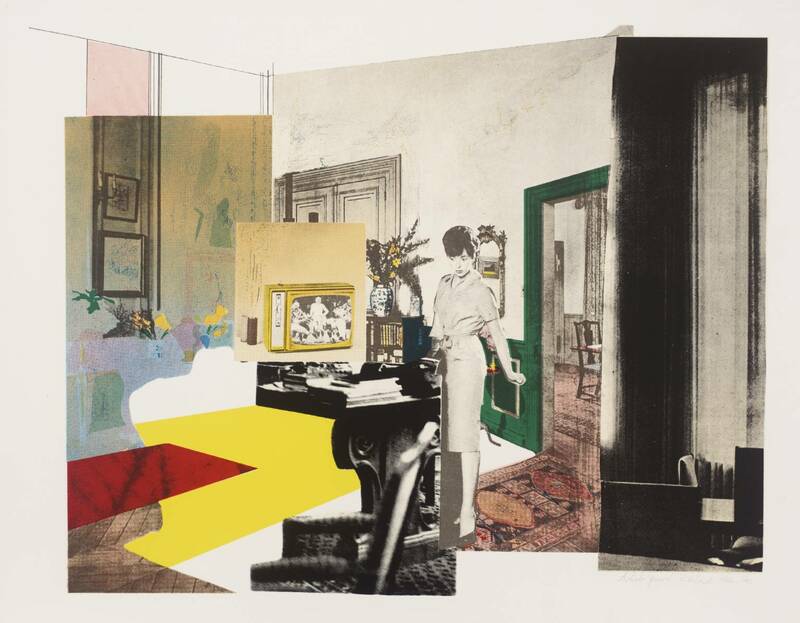 Above: Richard Hamilton (1922-2011) "Interior II" 1964-65. Above: William Eggleston (b. 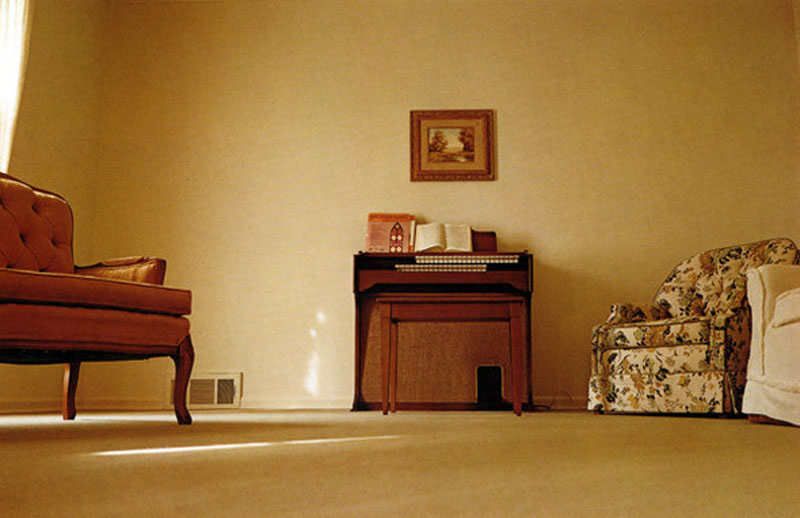 1939) Untitled (Interior with Organ) from "Troubled Waters" portfolio, 1980. Above: Joel Meyerowitz "Wilson cottage, Wellfleet" 1976. 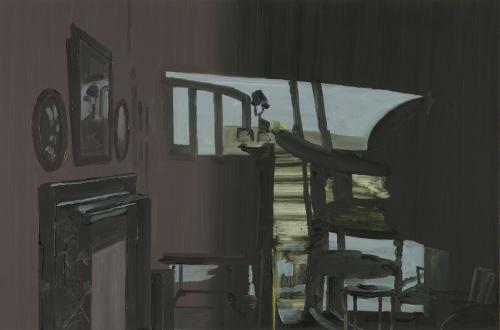 Above: Richard Walker "Library with Landscape" 2011. Above: Pieter de Hooch "Interior with a Mother Delousing Her Child", 1660. 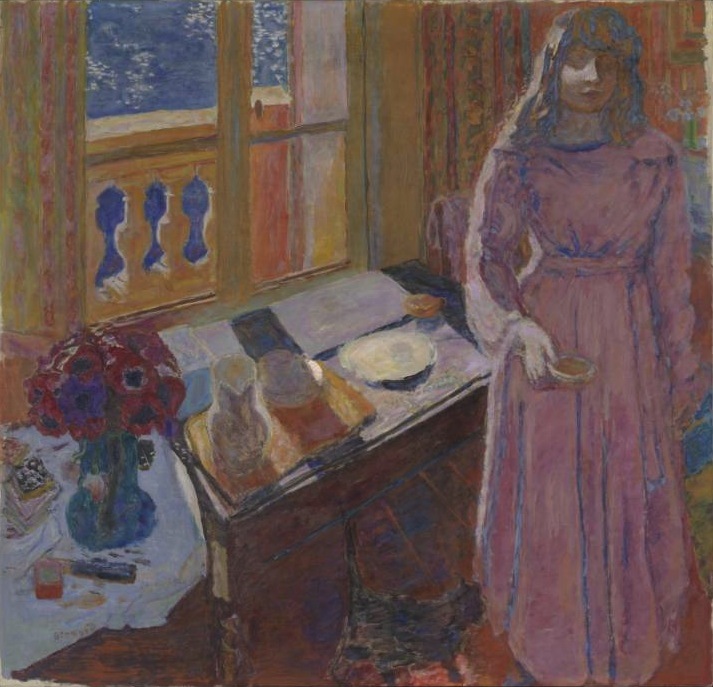 Above: Pierre Bonnard "Bowl of Milk", 1919, Tate Collection. Above: Pierre Bonnard "The Dining Room in the Country", 1913. Above: John Lessore "Paul and Rémi in the Dining Room" 1964. 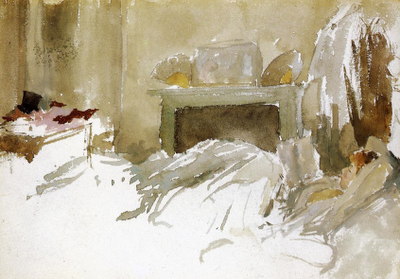 Above: James McNeill Whistler "Resting in Bed", 1884. 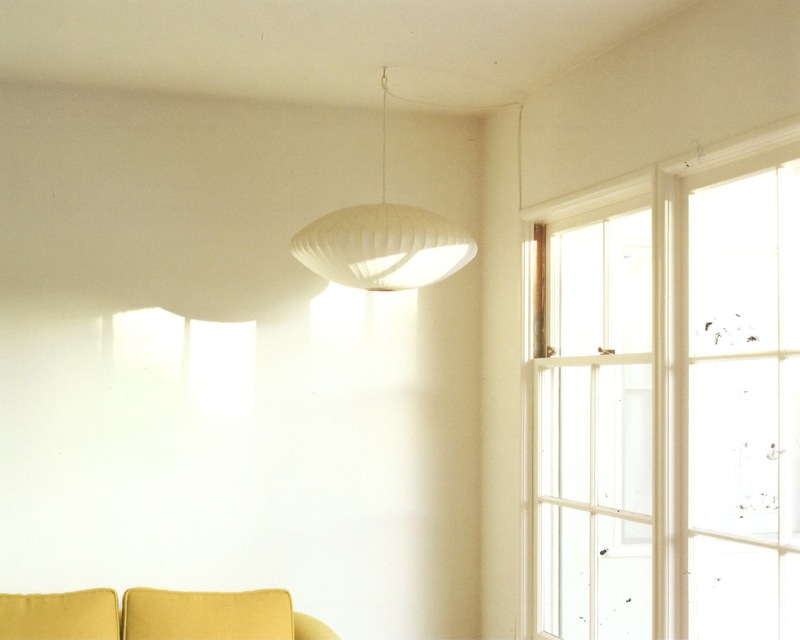 Above: Uta Barth from "Sundial (07.2)" 2007. 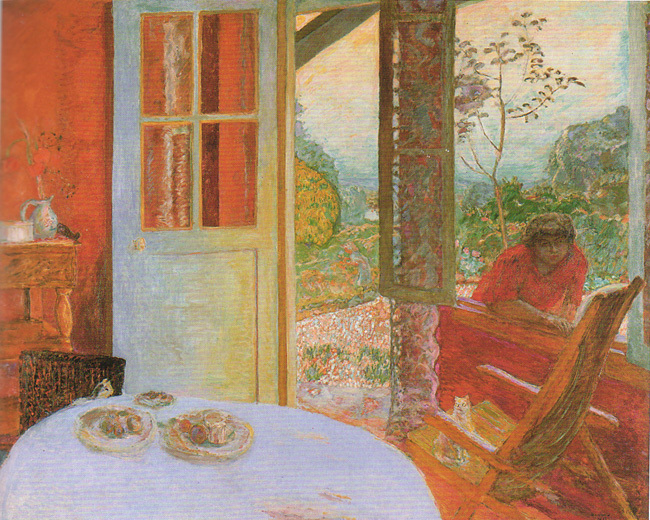 This is one of five panels. 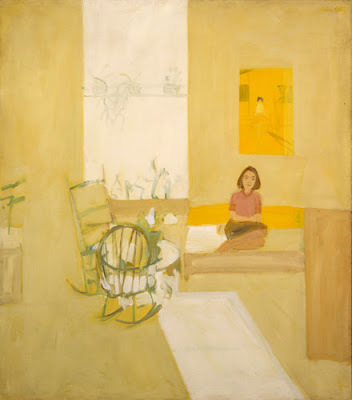 Below: Alex Katz "4 pm" (Former Yellow Interior) 1959 from Katz x Katz currently on view at Yale University School of Art's 32 Edgewood Gallery. Hello, I recently found your blog (can't remember how...) and am really enjoying your posts. 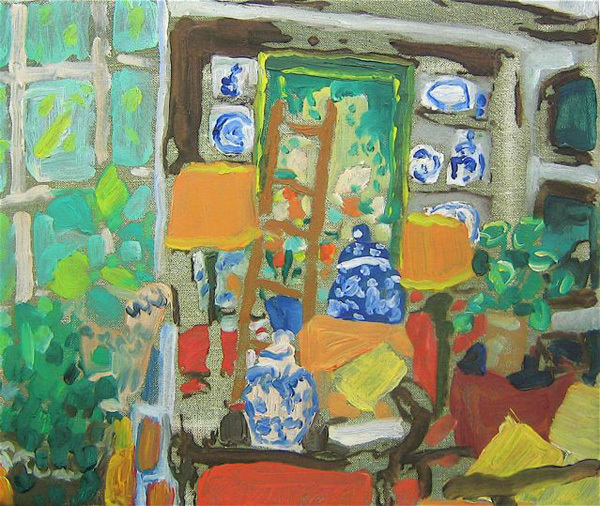 I have been trying to teach myself to draw and paint for the last few months and have found so much inspiration from the artists you have shown. 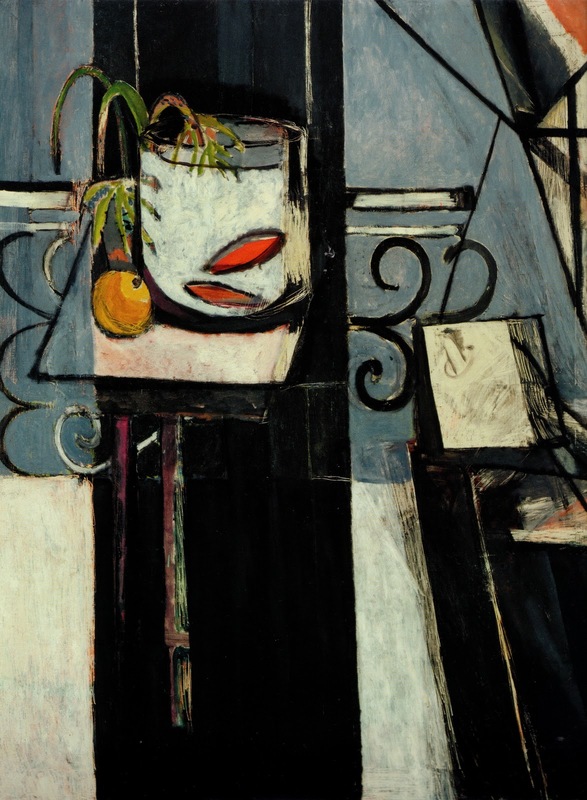 How on earth do you remember all these wonderful paintings, sculpture, and artists? Beautiful, thoughtful, inspiring, as always, Laura! 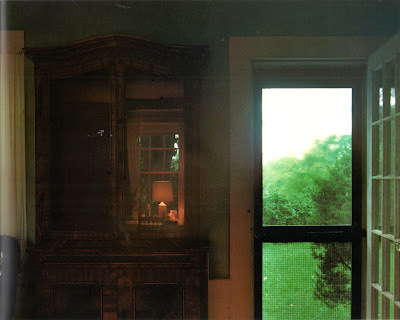 What a greatr selection! I needed this inspiration before I head into my studio-with a strong cup of coffee. 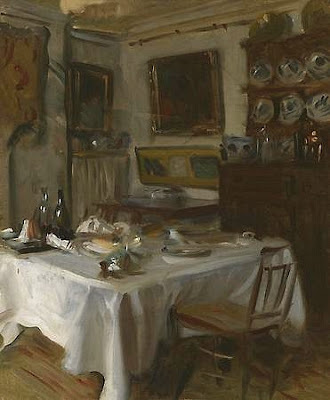 There is nothing like looking at beautiful paintings to make me want to run and pick up my brushes...Thank you for this and have a lovely day.